A block of 10 flats and five houses were constructed in High Lane, Hanwell for affordable rent through Ealing Council. The dwellings achieved Level 4 of the Code for Sustainable Homes, the system for measuring the environmental performance of new housing. The Level 4 rating means the properties will achieve a 44 per cent improvement in energy efficiency against current Building Regulations. The new homes were built on a small parcel of land that previously housed garage blocks. As none was required previously, no drainage existed for the site. The topography was such that the buildings were effectively on the side of a steep hill. 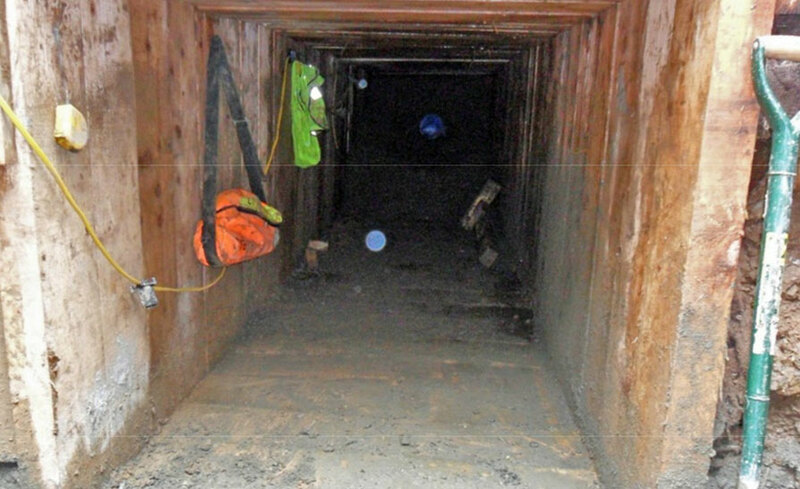 The local sewer was uphill of the development, over 6 metres below surface level. The sewer also ran beneath a footpath which had to be kept open. The footpath was in a narrow alley immediately behind the development, preventing a traditional open trench construction technique. A trenchless timberheading solution was sought. Terra Solutions were tasked by the groundworks contractor, Buxted Construction, to construct the connection from the development to the existing sewer. The sewer connection was required to commence at a depth in excess of 4 metres within the congested building site. The route for the connection involved passing beneath the site boundary and beneath a steep embankment. Terra chose to install a short timber heading from a small drive shaft within the site. The heading was constructed using adjacent frames in a “box” technique. Upon completion of the excavation, the sewer was connected into underground and a clay pipe laid to grade within the heading and packed with concrete. The timeberheading connection was successfully installed within 6 days with no disruption to the footpath or the site works, allowing for the construction of the houses and flats that will be available on the London Flatshares on Move Flat.